After releasing the video for “Get It Now”, one of the more sultry tracks from her last project, ‘Sugarcane‘, Tiwa Savage went on to record a remix featuring vocals from Omarion. His charming take on the radiant, dance-floor-ready track adds a bit more drama to the romantic song, plus recently released video is equally thrilling. 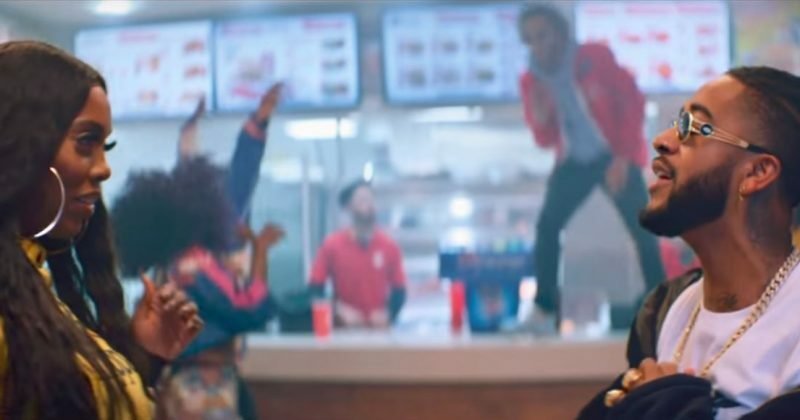 Meji Alabi directs the video for the remix of “Get it Now” with a cheerful theme, set in a fast food place. Tiwa and Omarion exchange suggestive looks though they both have their partners seated across from them. Though they stick with their dates, the connection is palpable, leaving viewers wondering which of them will eventually make the first move; “Time Is Running Out”. But the real allure of the video lies in its adequate representation of the youthful lifestyle, showing friends laughing, gossiping, dancing and ultimately disturbing the peace of the fast food place. Watch the video for Tiwa Savage’s “Get It Now” remix featuring Omario below.